I have been curious about Buddhism ever since years ago reading Siddhartha, the story of the life of Buddha. As a spiritual practice, Buddhism seemed somewhat mysterious, esoteric, and complex. All this talk about oneness, meditation, and remaining unattached perplexed and confused me. At the same time, there was something about it that was very intriguing. Now having done some reading about the teachings of Buddhism I would like to share with you what I took away as some of its central teachings that have informed my quest for a deeper and expanded understanding of how to live a spiritual life. In my view, Buddhism is in many ways spiritual practice in its purest, most highly developed form. I say this in part because it is not a religion. Buddha is not a deity. 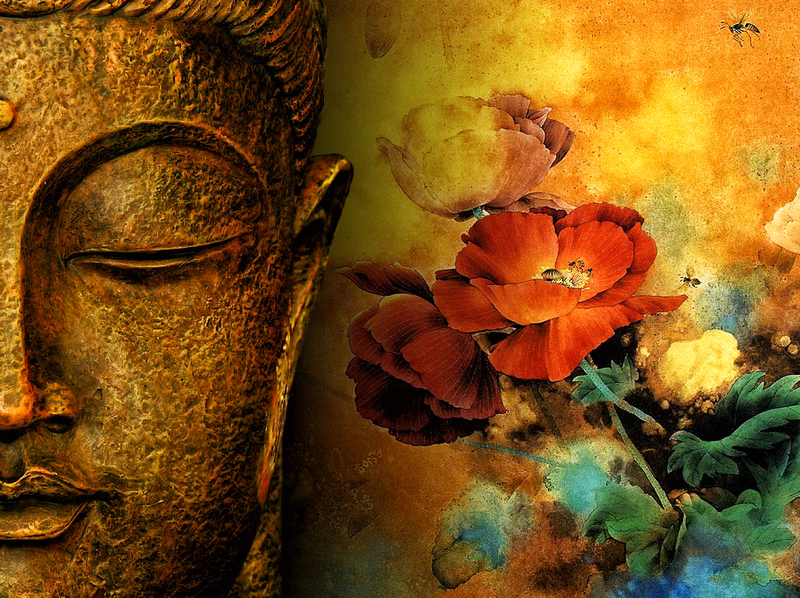 Buddhism is a spiritual way of living, and of conceiving the world and existence. It does not exclude or renounce a higher being; rather, practice of the concepts of Buddhism can serve as an adjunct or complement to any religion or for the nonreligious. For example, Buddhist belief and practice centers around universal love and compassion for all living things. Buddhism is a very deep and challenging practice with many elements and layers that takes many years of study to comprehend and master. What I share in this and the next article to follow are but two areas of Buddhist teaching that I found interesting and especially informative to living a spiritual life. These four states of mind and being are said to be at the core of an enlightened person. They guide and empower everything that an enlightened one does and their interplay and application create conditions for progression to the highest levels of spirituality. To practice these effectively one must go beyond self and extinguish the ego. These divine virtues are meant to be applied not only locally in everyday life, but also to be radiated in all directions throughout the world in meditation and/or prayer. In doing so, one is in communion with God. One must live in a way that radiates immeasurable love throughout the world to all living things, unconditionally without attachment or preference for one over another. Similarly, one’s compassion for all living things should be boundless and pervasive without discrimination or favor of one over another. It is a sincere desire that the suffering of all living things will diminish or end. This is selfless, measureless joy in the happiness and good fortune of all living things. Equanimity is a clear, tranquil, unselfish state of mind that is free from discrimination and prejudice and holds no enmity for any living thing. It is this state of mind that fosters, facilitates, and supports love, compassion, and sympathetic joy that are all pervasive. In a world filled with selfishness, greed, self-aggrandizement, and racial, ethnic, and religious discrimination, the Four Immeasurables represent a major paradigm shift. Nevertheless, instilling in one’s self the Four Immeasurable Minds should be the goal of anyone who wishes to be an authentic spiritual person in communion with God. What a wonderful world it would be if everyone (or at least a majority) patterned their thinking and actions according to these four states of mind! Brahmavihara. Wikipedia.org. Accessed February 6, 2016. The Four Immeasurables: Love, Compassion, Joy and Equanimity. Viewonbuddhism.org. Accessed February 6, 2016. This entry was posted in Religion, Spirituality and tagged Buddha, Buddhism, Four Immeasurables, loving-kindness, Religion, self help, self improvement, spiritual but not religious, spiritual life, Spirituality, spirituality beyond religion, spirituality by example. Very enjoyable intro into Buddhism! Thanks Alex! I appreciate you saying so. Blair, you are spot on. As you know, all the same teachings can be found in the New Testament! Check out Cao Dai “Buddhists”, based out of Tay Ninh, VN. I got a pretty good dose of their spiritual beliefs way back in 1967/68 and it definitely influenced my outlook on life, for the better. Not sure how they compare to “pure” Buddhists. Looking forward to Part 2 or your research! Cheers. Hey Charlie. Always great to hear from you. As you may know, the author of one of the books I referenced, Thich Nhat Hanh is a Vietnamese Buddhist monk who was active in the anti-war campaign back then.